9ft is appropriate length for customer easily to manage and reduce unnecessary space when users want to fix wiring harness in front of car. The wiring harness for LED off road lights is the perfect accessory for off road vehicles, working vehicles, and any vehicle that could use a relay to power specific equipment. 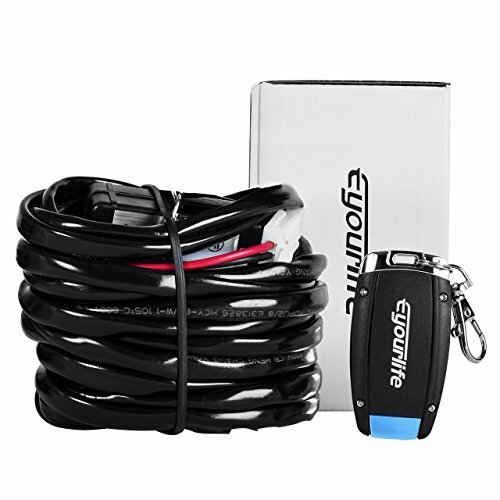 Consisting of a 40 AMP relay, a 4 modes REMOTE CONTROL SWITCH(ON-OFF-STROBE), and 9 feet of wiring, and this wiring harness for LED off road lights simplifies the installation process of powering various equipment on all vehicles. All vehicles and devices equipped with a 10 to 30 Volt DC power source. Suitable for led work light, led light bar, HID and Halogen lights any 7" 10" 12" 20" 30" 40" 50"52"light bars that is within 300w. If you have any questions about this product by Eyourlife, contact us by completing and submitting the form below. If you are looking for a specif part number, please include it with your message.